Nicolas Maduro, shortly before the explosions on Saturday. Venezuelan government officials say that two explosions at a military assemblage in Caracas on Saturday were in fact an attempt on President Nicolas Maduro’s life using bomb-carrying drones—and though the exact nature of just what happened is still being disputed, the idea that it indeed involved bomb drones isn’t as far-fetched as it sounds. Here’s what happened. 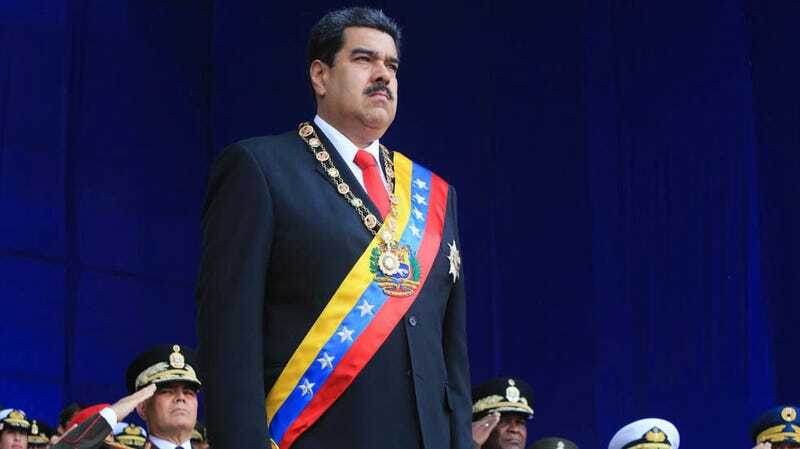 Per the Associated Press, at around 5:30pm ET, Maduro took the stage at a celebration of the National Guard’s 81st anniversay. Information Minister Jorge Rodriguez said the president then witnessed a “flying device” that detonated, followed seconds later by a second explosion, resulting in the injury of several soldiers present. In other words, Maduro’s government has a credibility deficit, and it’s tough to gauge whether this was some sort of staged event designed to strengthen his position or someone really did get mad enough to jerry-rig some crude bomb drones and fly them at the president. Signs of smoke on an apartment complex near the site of the explosions. According to the AP, another little-known group called Soldiers in T-shirts took responsibility, saying that they had flown two drones laden with C4 explosives at Maduro but government sharpshooters had taken the drones down. It’s not clear what that group is—beyond a purported organization of disgruntled soldiers and/or veterans—or whether the claim of responsibility was a hoax. If true, though, the attack would have ample precedent. The U.S. military has long used drones for targeted assassinations, and an increasing number of other militaries have begun to deploy their own drones of varying levels of sophistication. More similar to the Venezuelan government’s description of the incident are the drones used by terror group ISIS, which has infamously deployed off-the-shelf consumer drones strapped with explosives for years, as well as operated entire workshops dedicated to building or retrofitting unmanned vehicles capable of carrying deadly payloads in Iraq. Per Wired, virtually all of the methods for defending against drones come with some caveats. Radio frequency jammers that interfere with operator control also potentially interfere with other radio communications. Geofencing, or software restrictions on where drones can be flown, can be bypassed simply by installing modified firmware. A Dutch trial to train eagles to capture rogue drones failed when the birds did not always follow their training, and could have simply resulted in serious injuries to the eagles involved anyways. Just shooting the things is always a possibility—and the U.S. Navy has been testing lasers that do that—but does require someone with really good aim be on hand. Whether or not the explosions involved a drone, Venezuelans have been preparing for further fallout as Maduro’s government may be preparing sweeping mass arrests and military purges, the Washington Post reported. The Miami Herald reported that activists in the U.S. are warning that Maduro is very likely to use the incident as a pretext to attack the opposition, and he has already threatened “maximum punishment” and “no forgiveness” over the incident. “We saw the drone that looked like the size of half a bicycle. It came from the sky and we thought it was a boy playing with it,” said Pedro Peña, 62, who was in a seventh floor apartment with Gladys Miquelena, 56.